Donald Ross, one of Scotland’s great exports to America, has designed or remodeled some of the most magnificent and challenging courses on the planet. 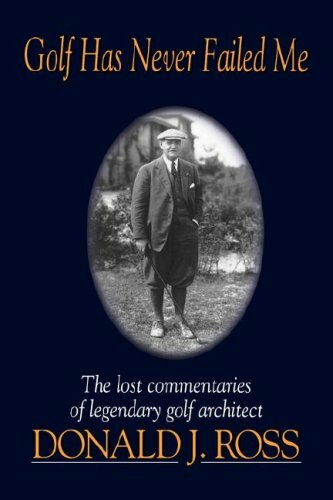 His commentaries on the rationale behind his architecture, penned before World War I but only recently rediscovered, present a continuous fairway of graceful and thoughtful insights into the game. Is there a golfer alive who can’t make use of such gems as “Holes should be trapped so that par golf depends upon skill rather than upon strength,” or “Hazards are placed so as to force a (golfer) to use judgment and to exercise mental control in making the correct shot”? Many years before his death in 1948, legendary golf course architect Donald Ross wrote a book that was never published. Within the manuscript, Ross offered many of his thoughts on the game that he so dearly loved. In the mid-1990s, the book was miraculously rediscovered and published to great acclaim. Golf Never Failed Me is an insightful look at the game by one of its most famous and beloved people. And what may surprise you is that many of the astute observations that he made so long ago still hold true today.